The Africa Newborn Network is a collaborative network of research studies funded in whole or part by the Bill & Melinda Gates Foundation through the Saving Newborn Lives program of Save the Children. The Africa Newborn Network involves researchers, Ministries of Health, UN agencies and technical assistance partners across the continent adapting and testing community-based approaches for newborn health. 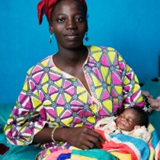 This Network is providing new guidance around ‘how, who, when and where’ questions for provision of life-saving newborn health interventions, particularly in settings with low access to health facilities. Through comparable results, country-to-country sharing, and capacity building for newborn health research, the Africa Newborn Network of trials will help inform integrated newborn care in these countries and across the continent. While virtually all newborn deaths (99%) occur in low- and middle-income countries; most funding and research focuses on high-tech care for the 1% of deaths that take place in developed countries. 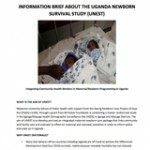 Trials and implementation research underway in eight countries through the Africa Newborn Network will answer some of the questions about whether these community-based strategies are both feasible and effective on this continent. The packages tested in Asia need adaptation and assessment for local settings, especially to strengthen links with the health system in countries where approximately half of all births take place in a health facility. Research is taking place in sub-national sites with links to national policy and scale up in Ethiopia, Ghana, Malawi, Mali, Mozambique, South Africa, Tanzania, and Uganda. All of these will measure change in coverage of service utilization and healthy behaviors. Seven of the sites are measuring cost through the Cost of Integrated Newborn (COIN) Care tool developed by the Medical Research Council of South Africa in collaboration with Save the Children. Studies in Ethiopia, Ghana, South Africa, Tanzania, and Uganda are cluster randomized control trials and three of these are powered to measure mortality outcomes. The results of the Africa Newborn Network of trials will inform integrated newborn care in these countries and across the continent. 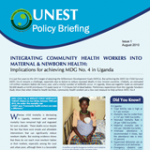 Comparable results – common definitions and tools mortality, cause of death, coverage, community health worker timing and retention indicators as well as cost using the Cost of Integrated Newborn Care Tool. Country-to-country sharing – a series of workshops and site visits have provided opportunities for investigators to share experiences, tools, findings and methodological challenges with each other as well as to interact with other newborn health experts and the technical and administrative team from Save the Children. Capacity building for research – the African Newborn Network is largely comprised of health and research professionals from the settings in which the research is taking place. Many network members are in the process or have finished post-graduate education linked to the research. 1. Lawn JE, Cousens S, Zupan J. 4 million neonatal deaths: when? Where? Why? Lancet 2005;365:891-900. 2. Lawn JE, Kerber K, Enweronu-Laryea C, Massee Bateman O. 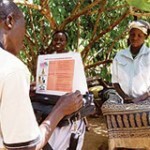 Newborn survival in low resource settings–are we delivering? BJOG 2009;116 Suppl 1:49-59. 3. Bang AT, Reddy HM, Deshmukh MD, Baitule SB, Bang RA. Neonatal and infant mortality in the ten years (1993 to 2003) of the Gadchiroli field trial: effect of home-based neonatal care. JPerinatol 2005;25 Suppl 1:S92-107. 4. Baqui AH, Arifeen SE, Williams EK, et al. Effectiveness of home-based management of newborn infections by community health workers in rural Bangladesh. Pediatr Infect Dis J 2009;28:304-10. 5. Bhutta ZA, Memon ZA, Soofi S, Salat MS, Cousens S, Martines J. Implementing community-based perinatal care: results from a pilot study in rural Pakistan. Bull World Health Organ 2008;86:452-9. 6. Manandhar DS, Osrin D, Shrestha BP, et al. Effect of a participatory intervention with women’s groups on birth outcomes in Nepal: cluster-randomised controlled trial. Lancet 2004;364:970-9. 7. Kumar V, Mohanty S, Kumar A, et al. Effect of community-based behaviour change management on neonatal mortality in Shivgarh, Uttar Pradesh, India: a cluster-randomised controlled trial. Lancet 2008;372:1151-62. 8. Nair N, Tripathy P, Prost A, Costello A, Osrin D. Improving newborn survival in low-income countries: community-based approaches and lessons from South Asia. PLoS Med;7:e1000246.